I finally got to her house last week and we worked together to display her dining room using the things I had created, along with some additional fun finds. This room was so much fun to decorate and I can’t wait to show you how it all turned out. My daughter found this beautiful mirror. We centered it over a buffet we had recently painted, (more on that transformation to come). 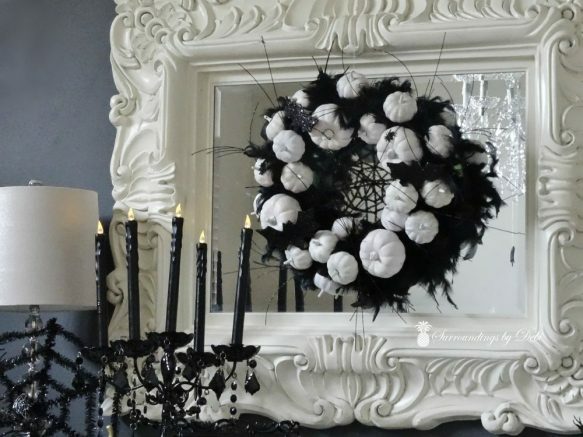 The black and white pumpkin wreath I had created, (you can find it HERE), fit perfectly on the mirror. How lucky was that? I hadn’t even measured the space before making the wreath! This great spider web was draped over the buffet. It added to our Halloween theme and was just the thing we needed to add interest to the white buffet. This cute spider, (can spiders be cute? ), accented the white lampshade. 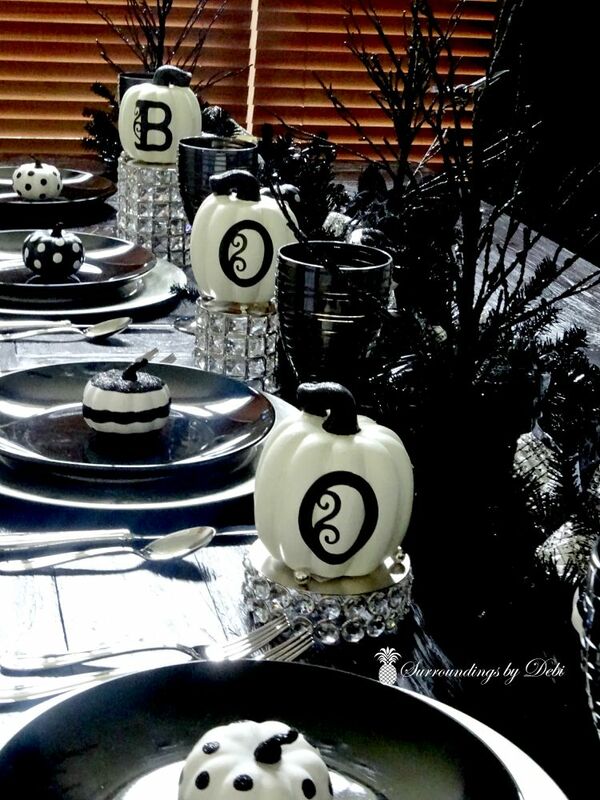 Weren’t these black candelabra the perfect addition to the setting on the buffet? Using black and white photos worked well with the theme. Our dining table was centered with a black garland. The garland came with orange balls but we simply removed those and added silver balls and rhinestone ribbon to complement our theme. Small glittered pumpkins in black and white were tucked into the branches of the garland. 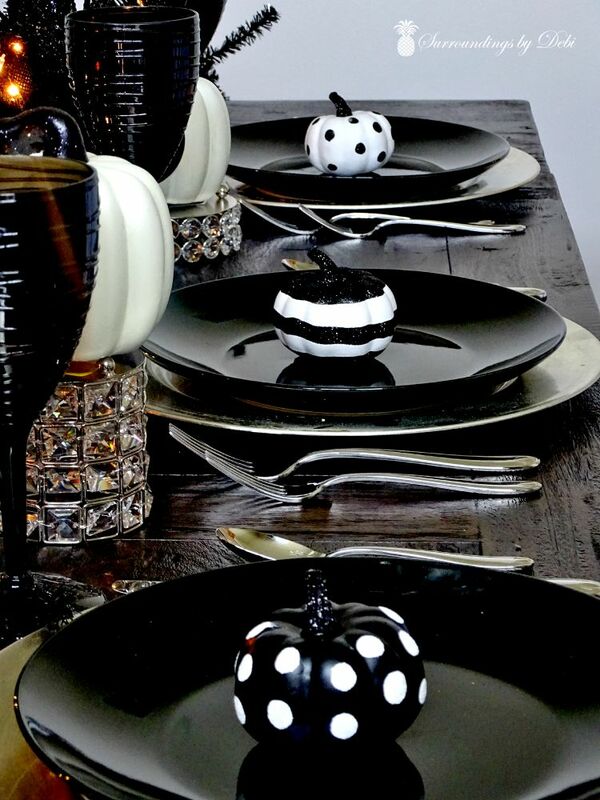 Silver chargers were topped with simple black plates centered with coordinating pumpkins. Black wine glasses set off each place setting. 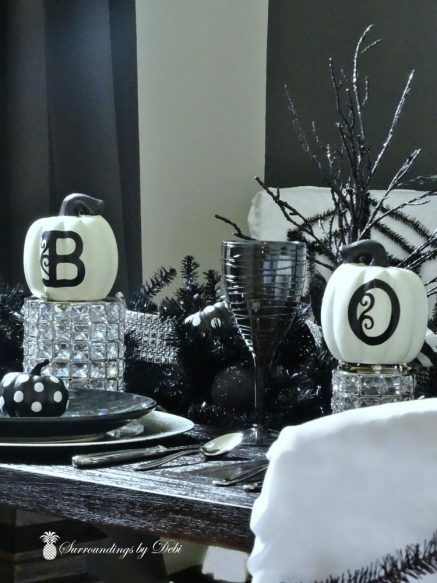 Remember the BOO Candlestick Accents created HERE? 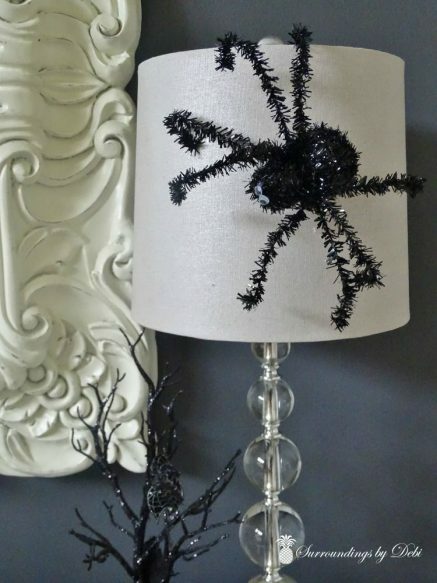 This time we sat them on silver rhinestone candle holders that had been turned upside down to give them a totally different look. 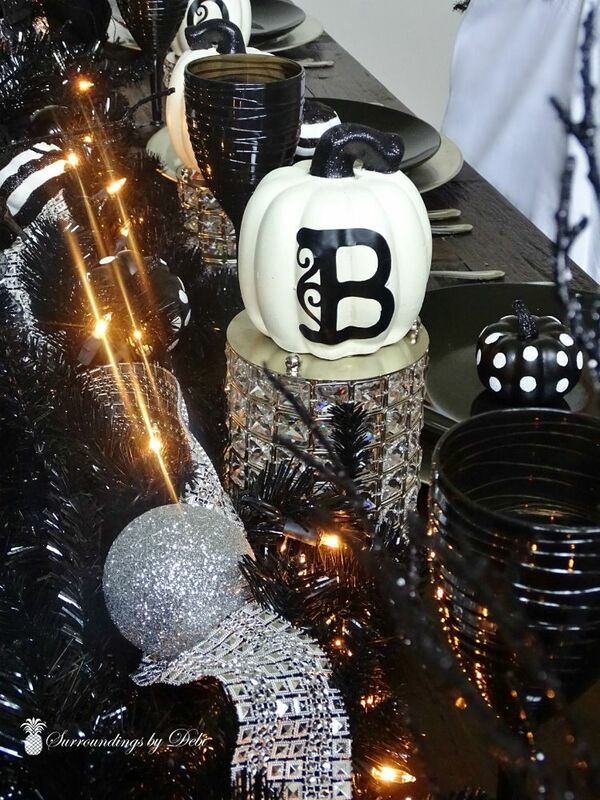 Little black glittered trees lined the table …. 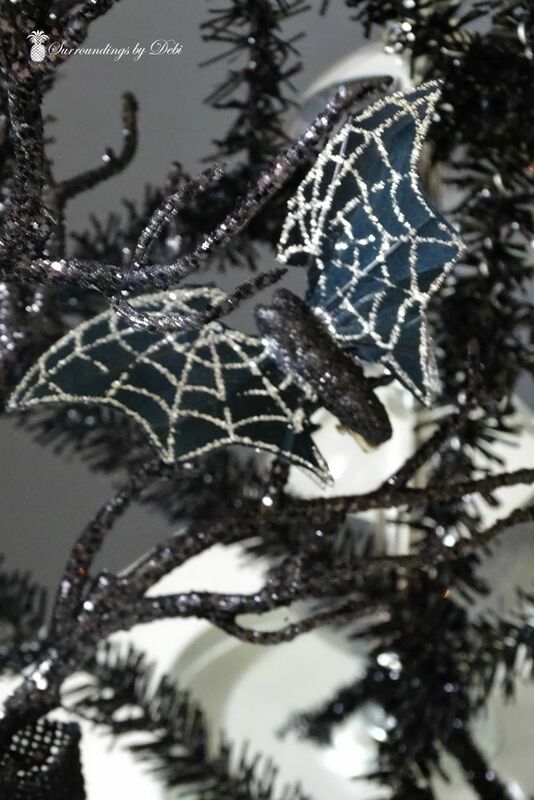 ….. and small glittered black bats were clipped onto the tree branches. We even tucked some black crows into the chandelier that hung above the table and hung small bats beneath. 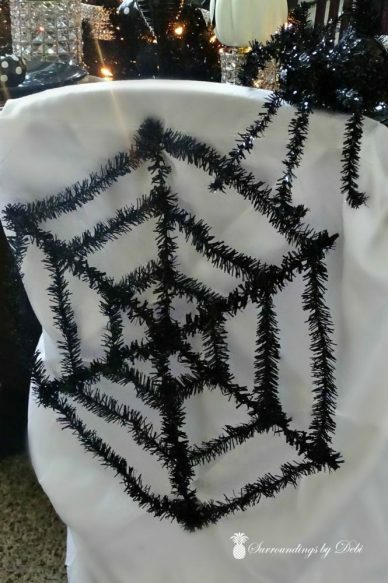 Black chenille stem spider webs were fastened to the back of the chair covers and spiders even adorned the top of one or two. What a great time we had working together to create this Halloween Dining Room. 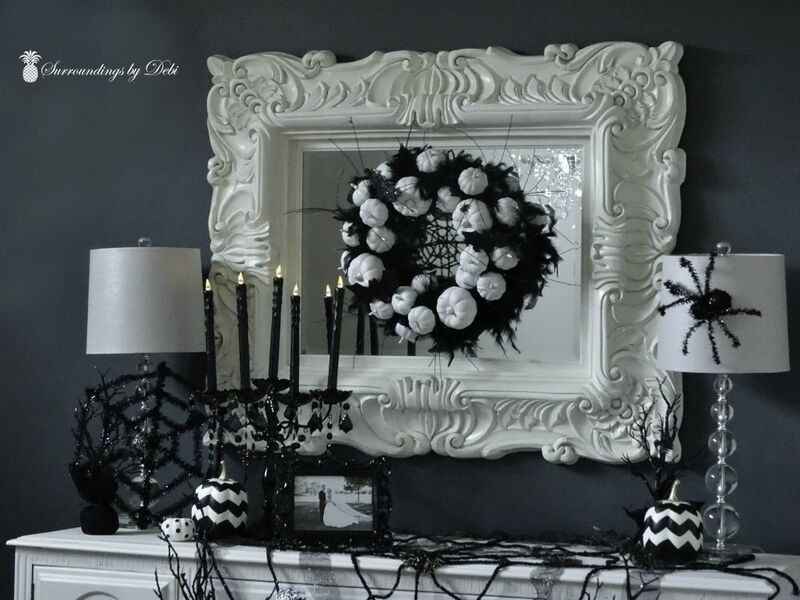 To me, there is nothing better than sharing my love of decorating with my beautiful daughter. 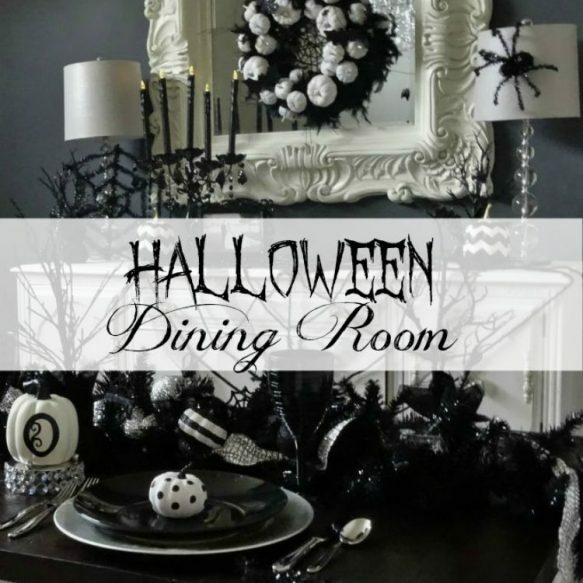 Who knew how elegant a Halloween Dining Room could be?? 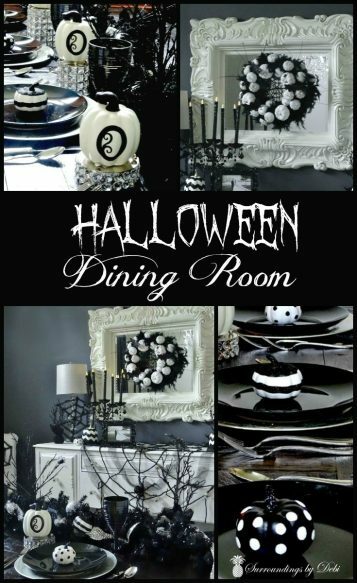 If you enjoyed this Halloween Dining Room, I invite you to pin it to your Halloween Idea Pinterest board. 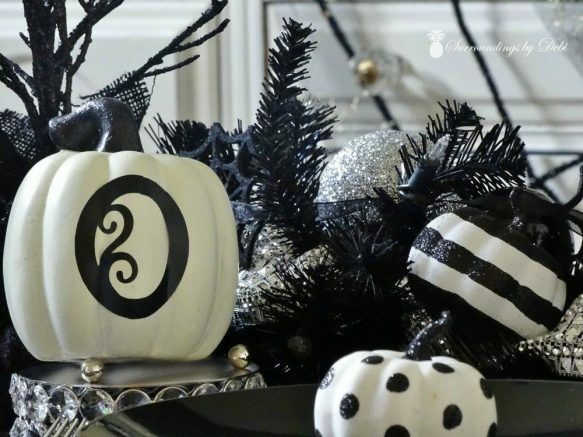 You can find all of the holiday ideas I am pinning HERE. Let’s share together! I love how you put this all together. It’s very elegant and tasteful. Love it! Thank you Belinda. Nothing better than working together with my daughter! 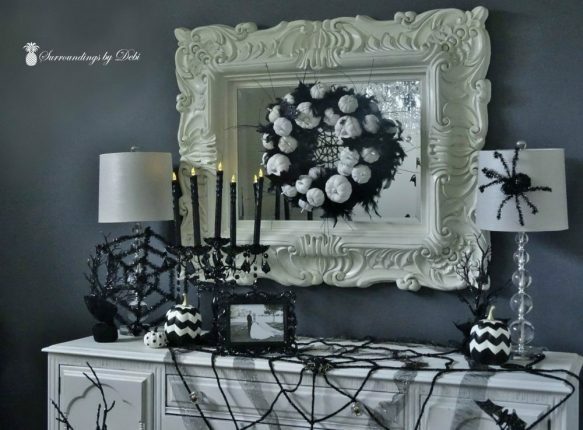 Debbi, what a fabulous job tastefully decorating in a black & white color scheme. Love all the embellishments throughout. 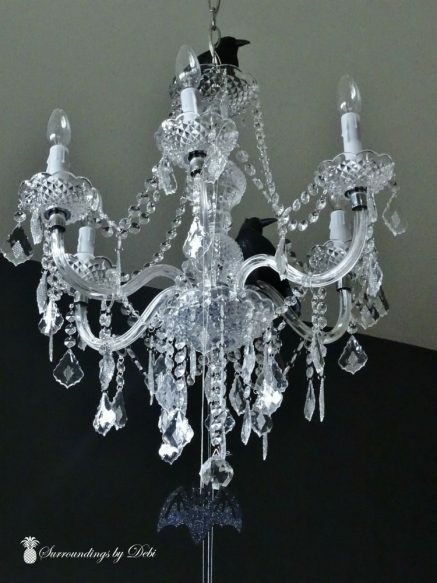 The crows on your chandelier is a great idea too! Thank you Marie. It was so much fun transforming this dining room. What until you see what we have in store for Christmas! 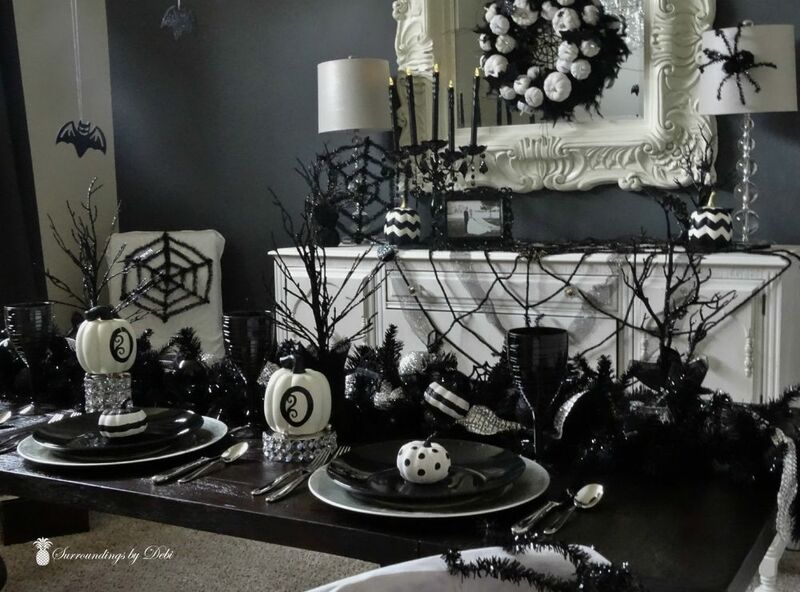 What a gorgeous space all decked out for Halloween! I love how it all came together…the wreath is gorgeous! Looks terrific! The black and white colour scheme is very striking and …scary! 🙂 Lots of ideas here! 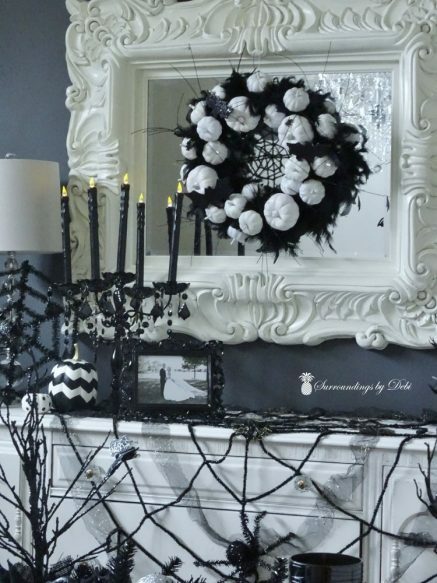 My fave is the feather boa wreath with pumpkins. Thank you Lori. Coming from you that is a compliment. I love your creativity! Have a wonderful week! Thanks Miss Sherrie! I love working with that girl! So chick and cute! 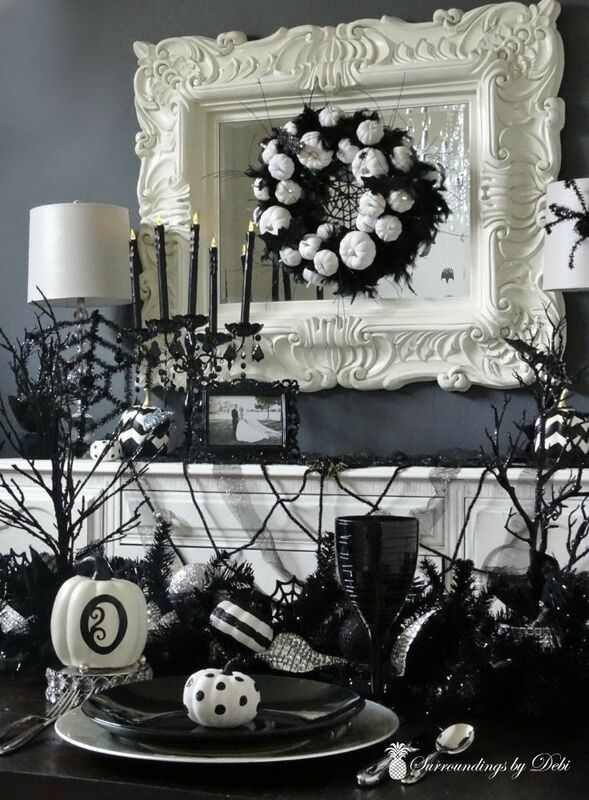 This is my kind of halloween decorating! Thank you for sharing at Dream. Create. Inspire. Link! I’ll be pinning your ideas! Thanks Cat! I loved doing this for my daughter and I think it turned out just as she wanted!That makes it all worth it!